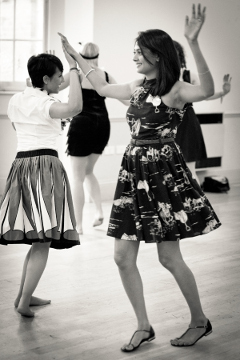 Bring out the rockabilly cat in you with our 1950s dance class. Jeepers! Having a 1950s hen party? Or a 1950s themed party for your birthday? Rock around the clock and release the jumping jiver in you. Do a warm up then learn a fun group dance routine to a bit of authentic rock n roll music, and feel like you’re at the hop. 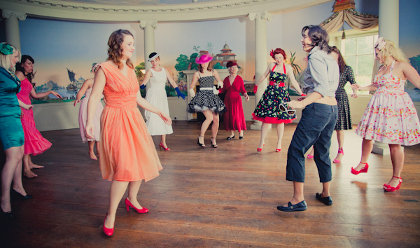 Then bust some 1950s moves on a dance floor somewhere later on, or get the guests moving at your party! 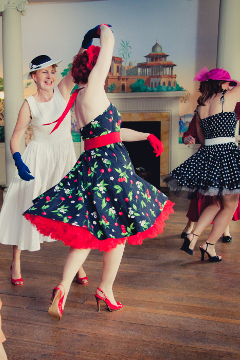 The 1950s dance classes are also popular at fifties themed weddings and evening parties, to get your party rocking and your guests up and dancing! Our dancers are great fun – see here for full details. We can offer 1950s dance classes in London, Oxford, Reading, Henley on Thames, Bath, Cheltenham or even Manchester and the Peak District.